#GaneshChaturthi is one of the most important festivals of Hindus in India. On this day, the birth of Ganesha is commemorated and this year, it will be celebrated on September 13! 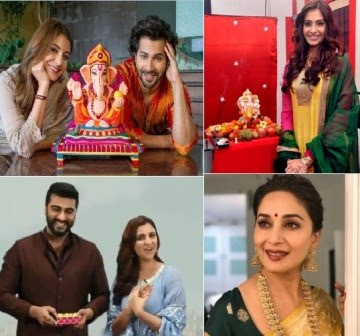 Bollywood Celebrities like Arjun Kapoor, Parineeti Chopra, Varun Dhawan, Anushka Sharma, Madhuri Dixit Nene and many more took to their social media profiles and shared warm wished their fans. Team Sui Dhaaga – Varun Dhawan and Anushka Sharma also shared wishes social media, along with message that message of Eco-Friendly Ganapati.